Chewy caramel-like confectionery balls made only of dates and truly raw cashews in a perfectly harmonious duet. So delicious that one is never enough. Chewy caramel-like confectionery desserts made only with dates and truly raw cashews in a perfectly harmonious duet. So delicious that one is never enough. 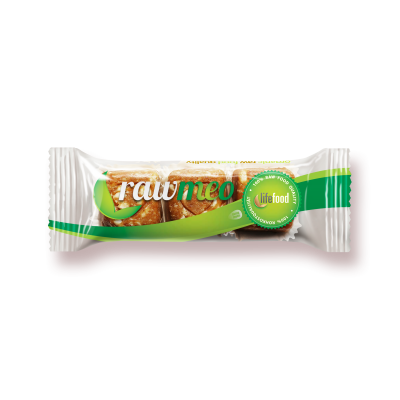 Rawmeos are small yummy raw confectionery desserts to satisfy your sweet-tooth. 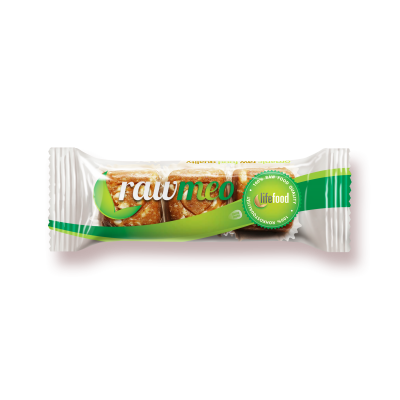 They are made with pure dried fruits, nuts and seeds and without any added refined sugar. These luxurious handmade small cubes make a lovely gift for your loved ones. So full of love and passion! Dates*, Truly Raw Cashew Nuts* (48 %). May contain traces of other nuts, sesame and mustard seeds, soy and celery. May contain occasional pieces of nut shells and fruit pits.